eShakti is making it's way to Canada!! I've been seeing (and coveting) some of these amazing eShakti pieces on some of my favourite bloggers so I was thrilled when eShakti invited me to review one of their products. I love a good bandwagon.... and I mean, who doesn't love clothes custom made to suit your preferences? A bit about eShakti- it's the only online women's fashion apparel company offering sizes 0-36W and custom clothing. They customise your clothes to your body and liking. The process was super easy from start to finish. You chose your selection from a huge assortment on their very user friendly website. Then you customise the length, sleeve type, neckline and if you want pockets. They can also fully customise an outfit for you from start to finish! I was torn between a peplum jacket and a dress-- beause I thought the dress had more of a late summery feel, I went with it thinking I could dress it up or down as I wanted. And I thought the black on the sides was slimming. 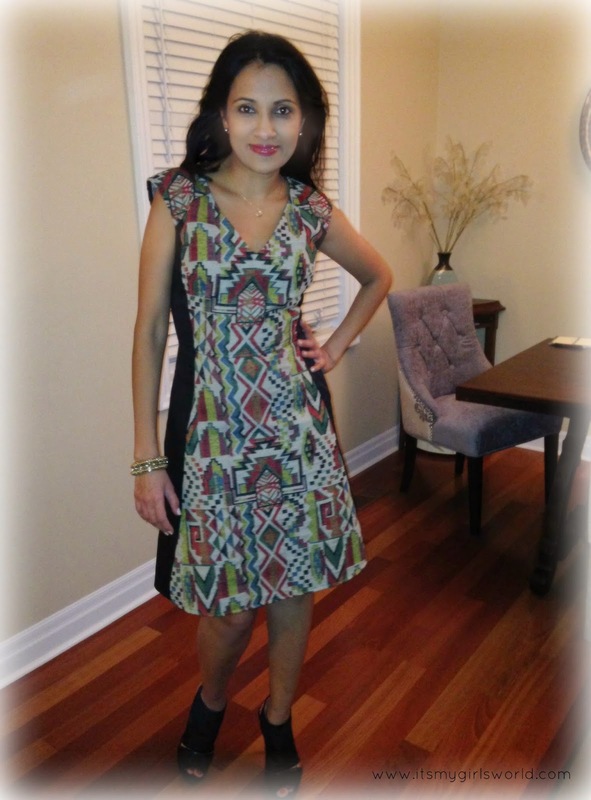 When I got the dress however, the fabric was heavier making it a perfect piece to wear in the fall as well or even as a fun party dress for the holiday season. I loved the print, the stitching and the quality, structure and sturdiness of fabric. However, I'm usually an XS or S in tops and an S sometimes M in bottoms. I botched the sizing a bit, as I chose a size 4 dress based on my upper body, thinking the fabric had a bit more give. I should have sized up one but ask them to use the size 4 measurement for the top. Also, I didn't love the pockets as they pucker out a bit at my waist--- but then again that's because I messed up on the sizing. So for you my fantastic readers, you can use the code "itsmygirlsworld" to get 10% OFF at eShakti valid until 12/12/2014. You should know that it can also be doubled with the $30 off you get when you register with them. Also, right now they have a 40% site wide sale, so you won't even need my 10%- but you can still use the $30 off. Confusing I know, but so worth it to check out eShakti now! Linking up with Morgan for Mid Week Muse. Total sidebar: 'Shakti' is hindi for empowerment. Get it? Empowering women to choose and create their own design and style. As a former brand marketer, I totally dig the brand name and what it stands for! So cute! Love the pattern! Love your dress! How funny, my post today is my eShakti dress! Beautiful dress! I love eShakti! I did a dress review for them a few months ago! I love the one that you chose tho! That print is gorgeous! I was asked to do a product review for them and I'm so excited! I picked a coat so we'll see how it goes! You look hot, great dress! That dress is beautiful on you! And your post was very informative. Thank you for sharing what eshakti means. That's really, really cool! Beautiful dress and the black down the sides is very slimming and flattering. Awesome dress. I am now a member/follower of your blog now! You look beautiful in that dress. I think it is slimming with the black panels and the shoes are complementing. You look gorgeous! I've been hearing about this company for awhile now! I am definitely going to have to check it out! I'm so glad you had a great experience with them. I tired to get shirts on two separate occasions and did not have success with their custom sizing at all. Oh, this is a lovely review. I love that they have such a large selection of clothes and in all those different sizes. The customization sound s alittle tricky for me, but it sure adds up to the fun. All these collections are awesome. I love the pink collections, pink being my favorite too. Good product for great price as well.